According to Institute for Health Metrics and Evaluation (IHME) statistics, mortality rate due to diabetes in SVG increased by about 11.6 percent in the past decade (2005 to 2015), with a mortality rate of around 91.24 people/ 100,000 populations. The purpose of this project is to strengthen the integrated care ability among health workers, promote health knowledge, and provide epidemiological report. Assist in planning effective integrated care strategies and practices on the prevention and control of diabetes. Strengthen the ability of integrated diabetes care in healthcare facilities. Improve health self-management of community people for prevention and control of diabetes. Health officials to visit Taiwan to understand Taiwan’s policies, integrated care and health education programs related to the prevention and control of diabetes. 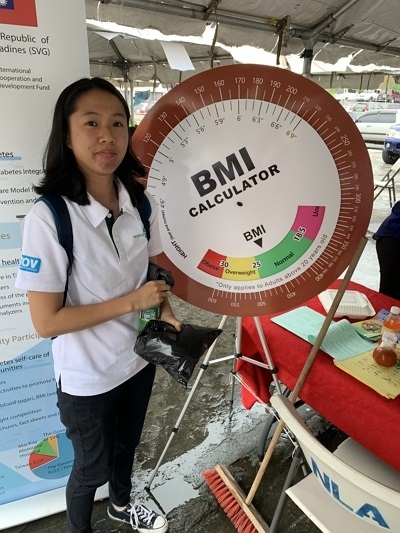 Health officials to design the SVG integrated diabetes care model with the assistance of consultants from Taiwan, and submit an integrated diabetes care report with recommendations. Hold at least one international conference focusing on prevention and control of diabetes. Conduct an intervention study of diabetes health education through utilizing the case tracking and management model, and produce an epidemiology report. Strengthen the function of chronic disease integrated care team in at least one district hospital. Strengthen the hardware equipment which related to NCDs in selected healthcare facilities. Hold health education and promotion activities in the community. Three health officials from SVG visited Taiwan on August and completed an integrated diabetes care report with recommendations. Completed seed instructors training on diabetes integrated care for 2 physicians, 2 nurses, 2 dietitians and 2 health promoters in Taiwan. Completed the procurement for five HbA1C analyzers and fifty five foot care kits. Distributed 50 project promoting leaflets and 320 diabetes health education leaflets on World Diabetes Day.